To schedule an appointment, please use the form below or call (563) 556-2711. At Exceptional Dentistry, it is our goal to make you and your family smile! 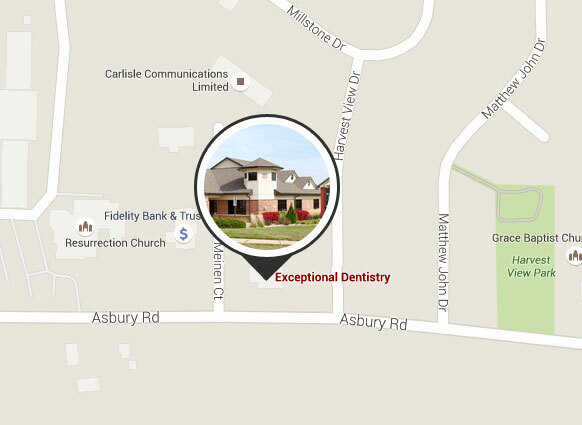 Exceptional Dentistry provides cosmetic, family and general dentistry to the communities of Dubuque, Dyersville and Davenport, Iowa, as well as Galena, Illinois. Please contact us with the form above to schedule your personal consultation. Take Hwy 20 East to the Northwest Arterial. Turn Left (North) and drive 1.9 mi. Turn Right (East) onto Asbury Road and drive 0.4 mi. 4200 Asbury Rd will be on your left. Take Hwy 20 West to the Northwest Arterial. Turn Right (North) and drive 1.9 mi. Turn Right (East) onto Asbury Road and drive 0.4 mi. 4200 Asbury Rd will be on your left. Take US Hwy 61 North to S Locust St in Dubuque. Take the Locust St exit toward US-20/Downtown District/Westend District. Continue onto S Locust St for 0.4 mi. Turn Left (West) onto Dodge St/ Hwy 20 West. Continue 3.9 mi to the Northwest Arterial. Turn Right (North) onto NW Arterial and drive 1.9 mi. Turn Right (East) onto Asbury Road and drive 0.4 mi. 4200 Asbury Rd will be on your left. Take Hwy 52 South to the NW Arterial. Turn right onto the NW Arterial and continue for 3.2 mi. Turn Left (East) onto Asbury Road and drive 0.4 mi. 4200 Asbury Rd will be on your left. Take 151/61 South to Dodge St/ Hwy 20 West. Turn right onto IA-946 S for 0.1 mi. Turn left onto Locust St for 0.1 mi. Turn Right (West) onto Dodge St/ Hwy 20 West. Continue 3.9 mi to the Northwest Arterial. Turn Right (North) onto NW Arterial and drive 1.9 mi. Turn Right (East) onto Asbury Road and drive 0.4 mi. 4200 Asbury Rd will be on your left. "I love the outstanding sweet receptionist, professional quality hygienists and #1 dentists... EVERYONE greets me with a warm smile and kindness! I enjoy going to the dentist, when years ago I dreaded going and put it off! I now SMILE with confidence and I have the excellent staff at Exceptional Dentistry to thank for that! I have recommended to my family & friends the quality service you receive from Dr. Murray and his staff.. and they too are happy patients!"